The Hawkmoon is an Exotic hand cannon introduced in Destiny Year One, exclusive to Playstation users only. A Year Two version of Hawkmoon is available in The Taken King to Xbox users as well. 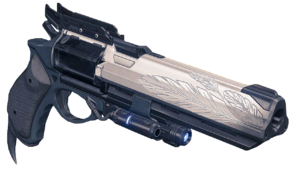 The Year Two Hawkmoon was made available on all consoles, and no significant changes were made to this specific weapon. With the release of Rise of Iron, Hawkmoon has been given two Ornaments that have a chance of dropping from Radiant Treasure boxes and Treasures of the Dawning. Luck in the Chamber: One random bullet in the magazine causes considerable bonus damage. In-game screenshot of the Hawkmoon. Side view of the Hawkmoon. Extracted side profile of the Hawkmoon. Side render of the Hawkmoon. Front render of the Hawkmoon. Back render of the Hawkmoon. The two ornaments available for the Hawkmoon.